Hello there fabulous Lulu Art fans and happy 2019! 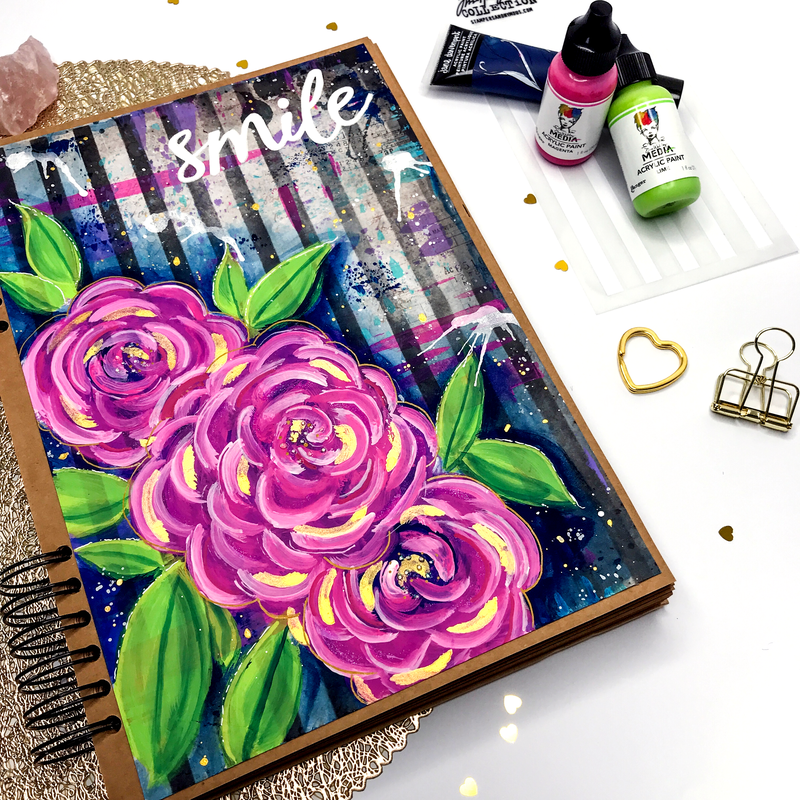 Today I’m going to grab some beautiful paints, a stamp and stencil and of course my signature sparkles, and show you how to create this bright and bold art journal page! 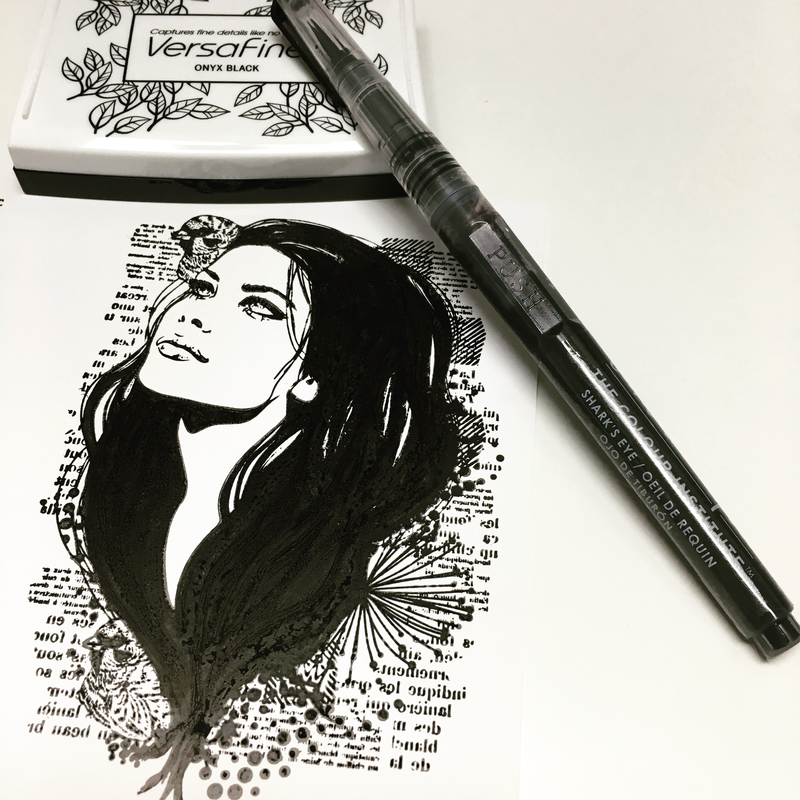 It’s pretty, filled with simple techniques and really packs a punch of colour! Now as with most things it’s easier to show to the process for this page rather than tell you about it – so I’ve made a short video to walk you through it all step by step. 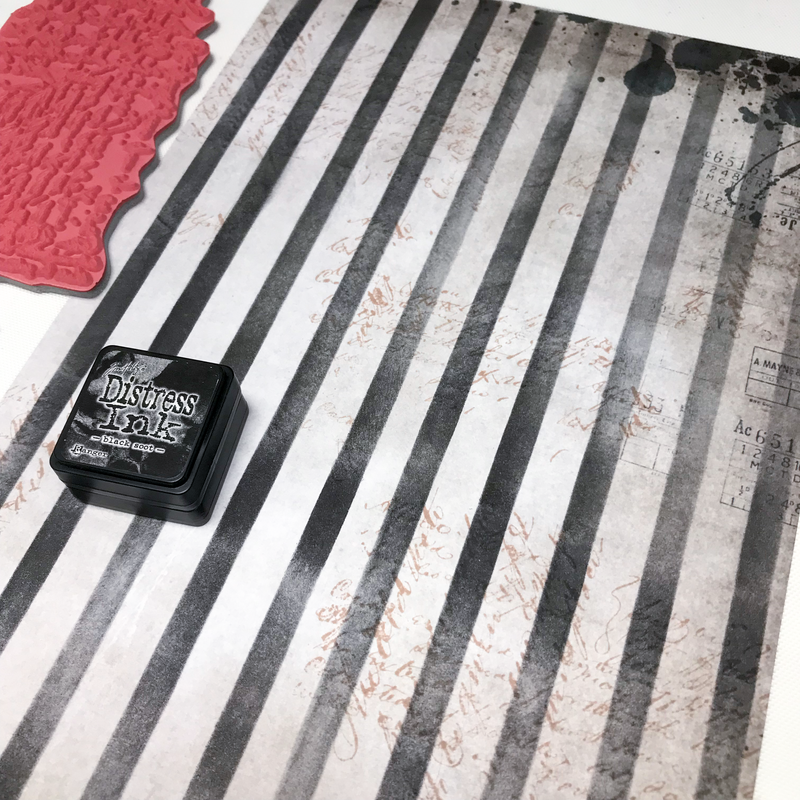 Cut 7 Dots Studio background paper to size (Homegrown) and then stamping with a Handwritten Text Stamp from Tim Holtz and Sandy Toes Squid Ink, then use Black Soot Distress Ink to add stripes with Shifter Stripe Stencil. 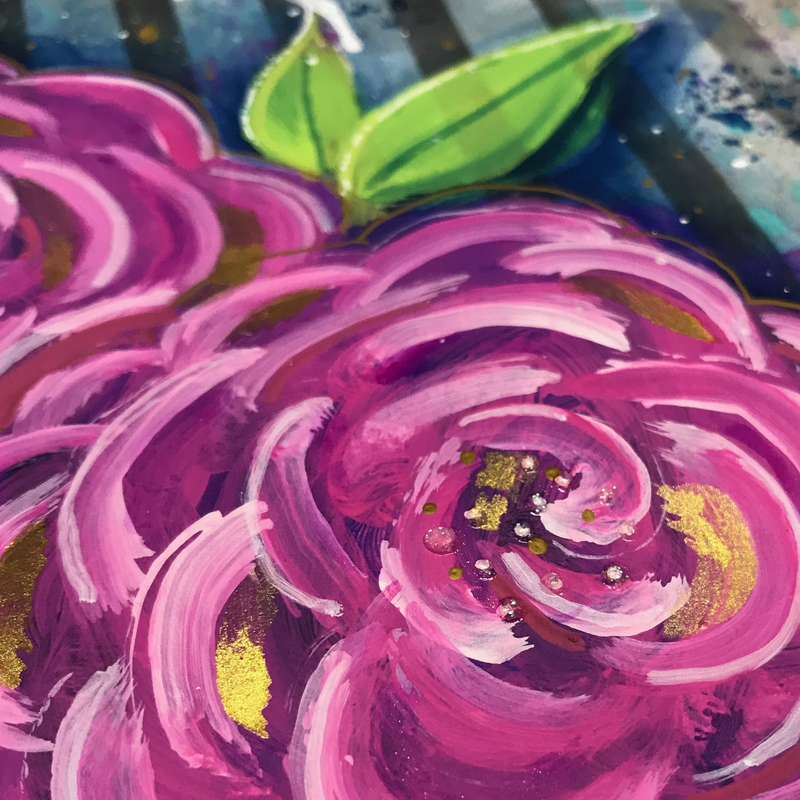 Add tiny bits of paint to the background using a paint scraper, I used Jane Davenport Acrylics and Dina Wakley’s Magenta and Turquoise. 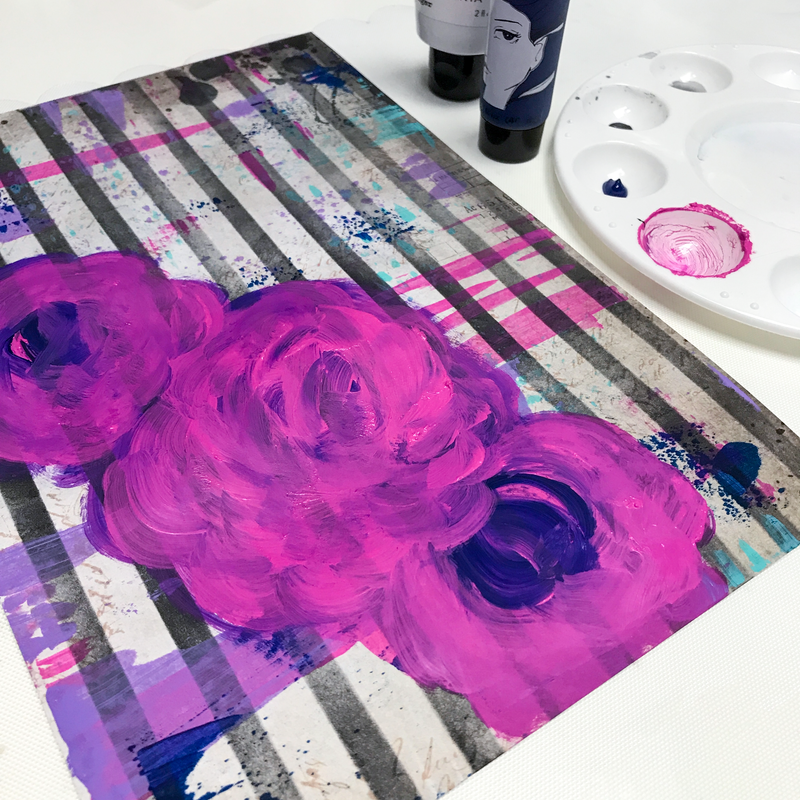 Use Magenta and Dark Blue Paint with a flat brush to create the flower bases. 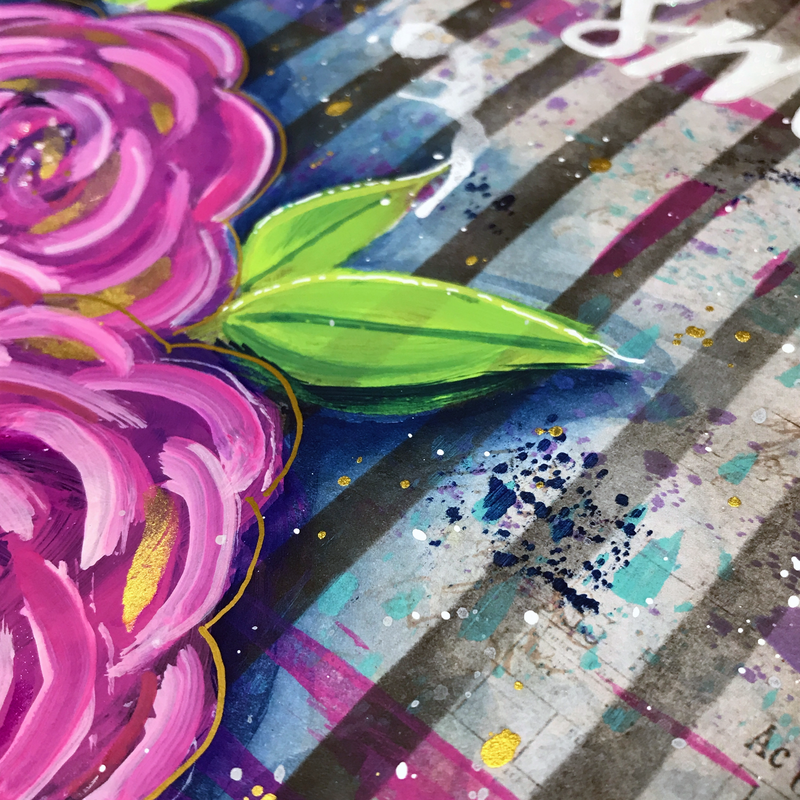 Add a second layer of Magenta to hide the background. Add a base layer of lime green to create the leaves and mix in a little of the blue paint to get a variety of green shades – it makes the leaves look more interesting. Then use blue paint and a wet brush to edge the floral pattern. Splatter Distress Ink with water then blot with paper towel and begin to add the details. 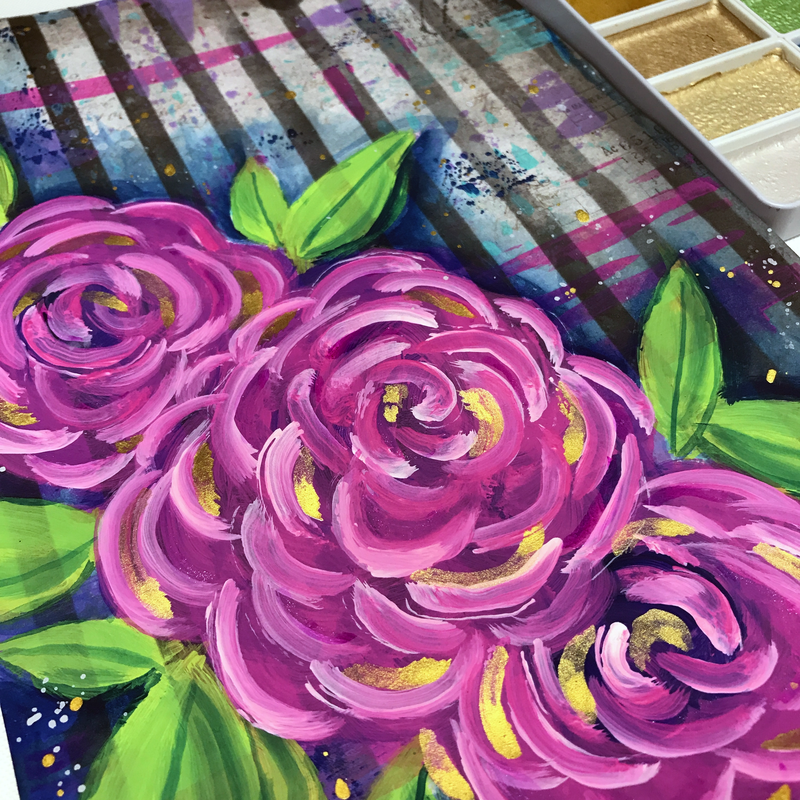 Begin by adding extra detail to the flowers, using a flat brush add pink to one side of brush and white to the other side and paint the petals. 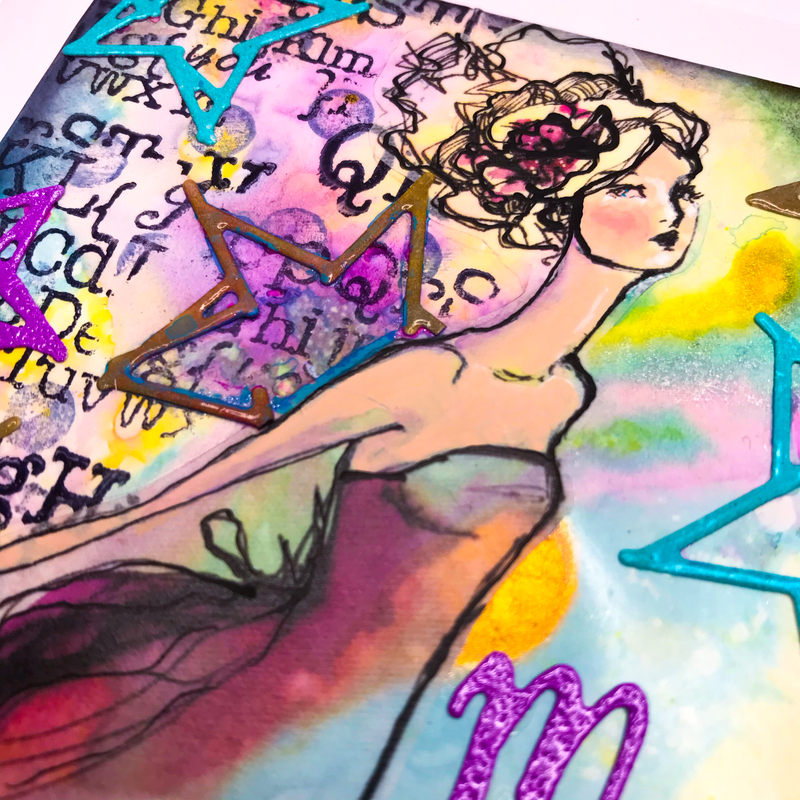 Then make that page shimmer by using the Starry Colors set from Gansai Tambi – add Starry GOLD and magenta and silver Metallic Mermaid Markers! 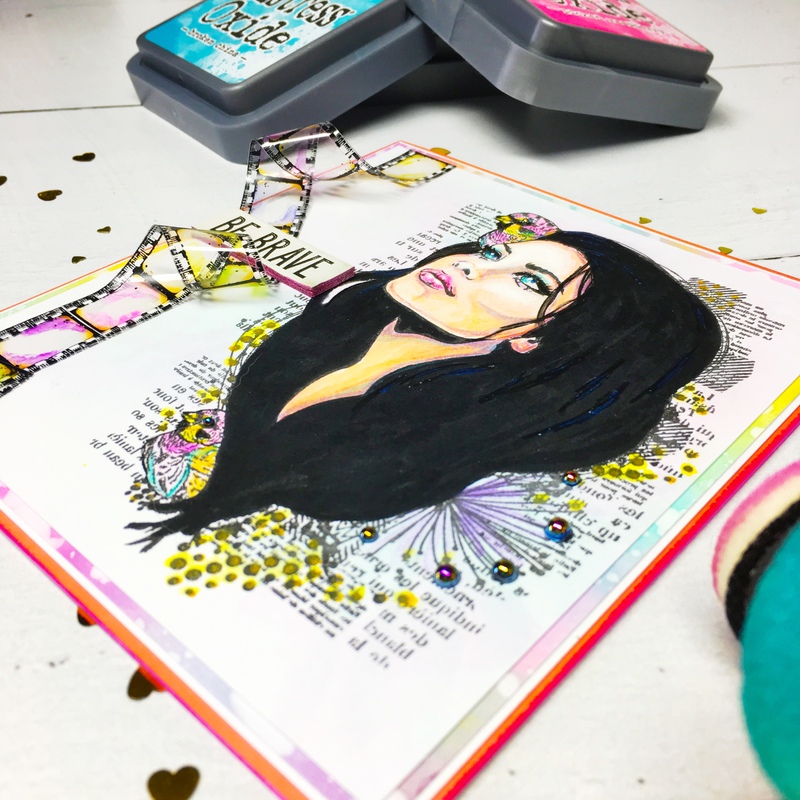 Just watch the page begin to shimmer! Flick the background with Starry Gold and also add this to the flowers. 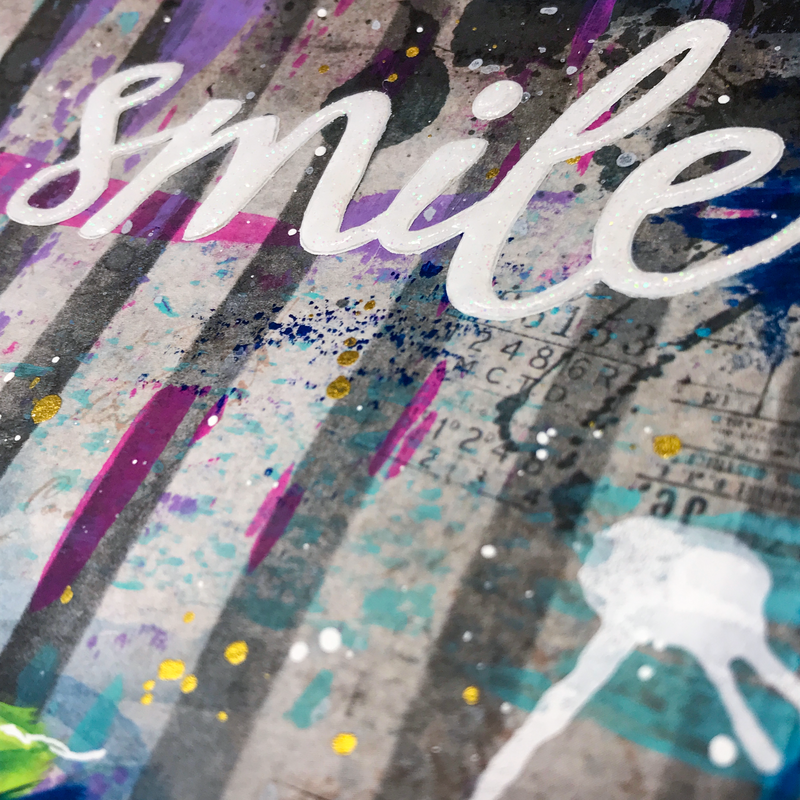 Cover the smile sticker with white paint, then add the sticker to the page and add more white paint (so it really pops) then cover with Nuvo Glitter Drops and add a few white Higgins Drawing Ink paint drips to break up the background. Also, embellish flower with Nuvo Glitter Drops. 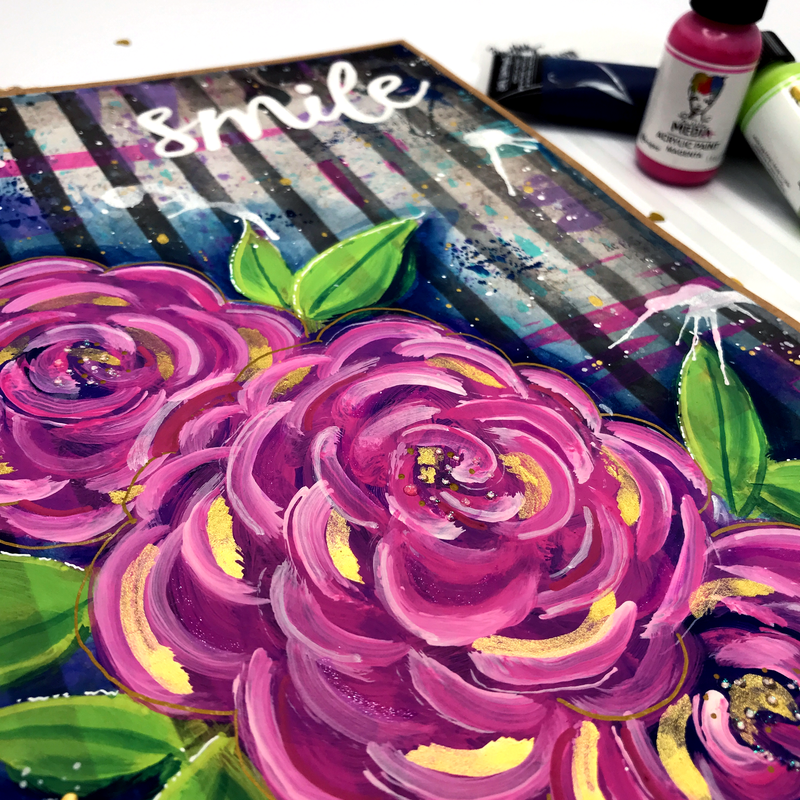 Add doodling and outlines to the flowers and leaves with Paint Markers. 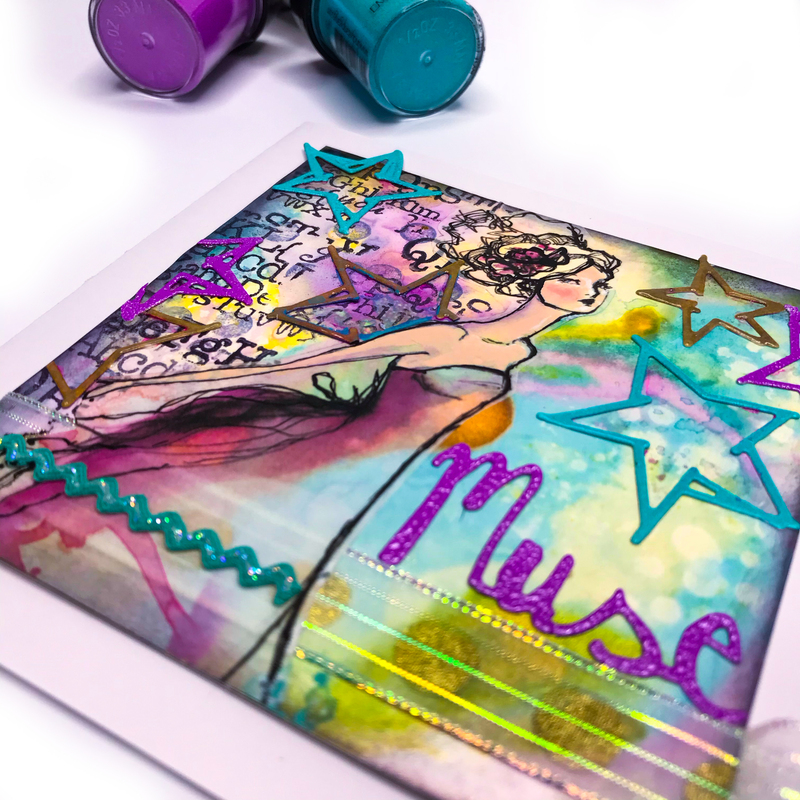 So grab a few of these yummy products from your favourite Mixed Media store (Lulu Art of course) and get crafty! 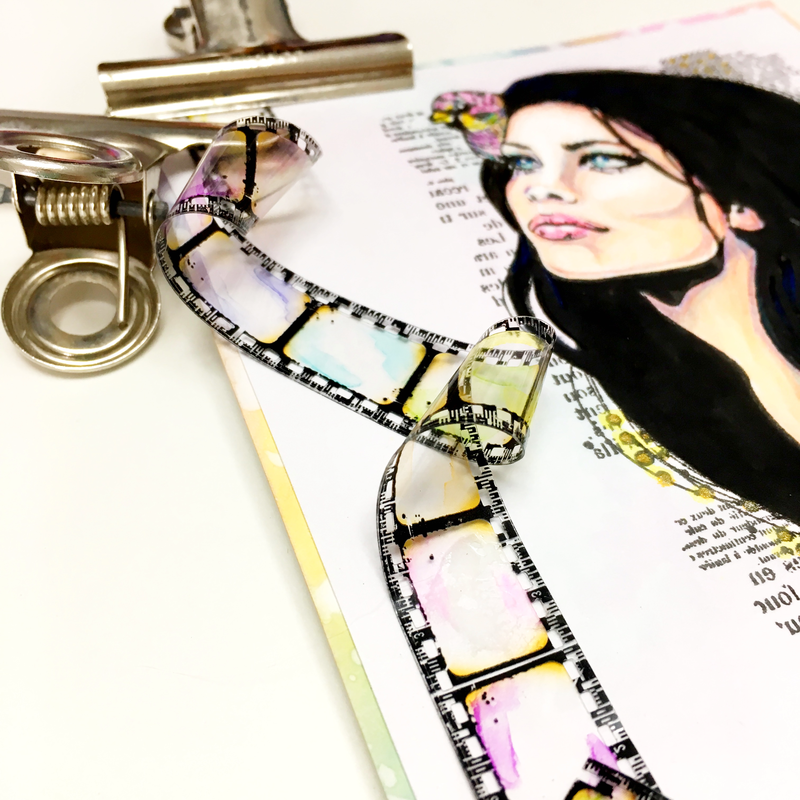 Want to make a beautiful background that practically leaps off the paper? 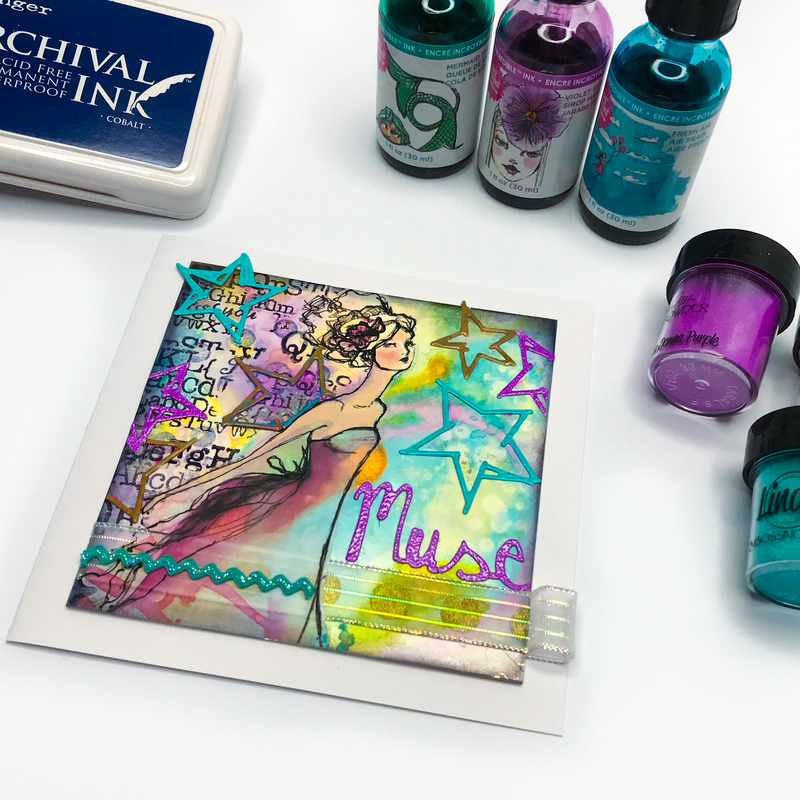 Then let me show you how amazing Jane Davenport’s INKredible inks look on Yupo and you will be racing to the store to grab the supplies and try this yourself. Allow any remaining areas to air dry. Just look how beautiful this is – simply amazing. 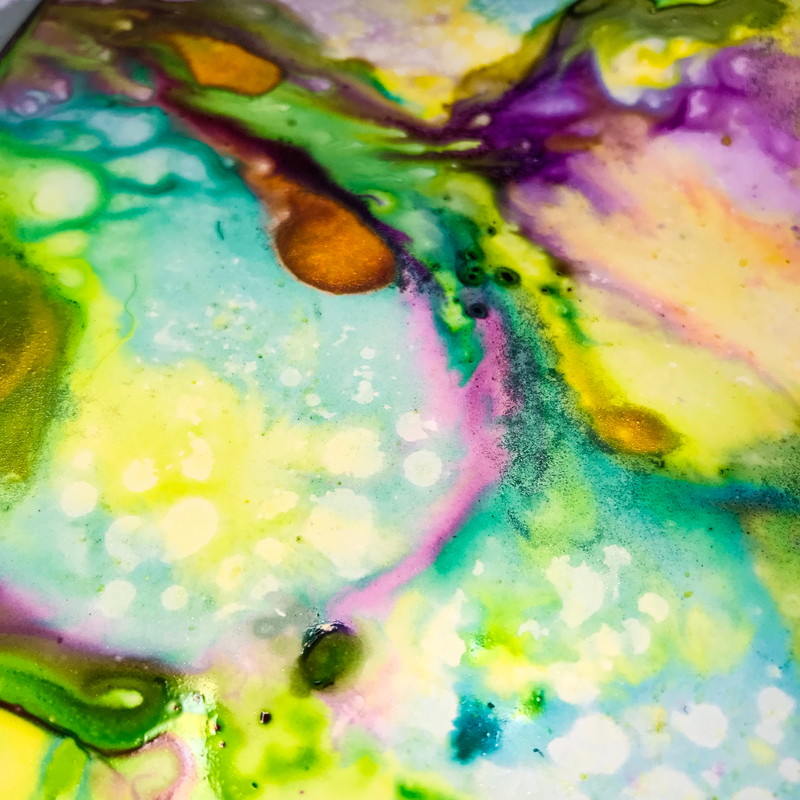 Watch this card come together and see this amazing INKredible Ink on Yupo right here in this video. all from Lulu Art of course! A super quick journal page today, especially for anyone who is a little shy about drawing. I thought I would put together a page using Jane Davenport’s ‘Whimsical Girls’ book that you can purchase from Lulu Art. 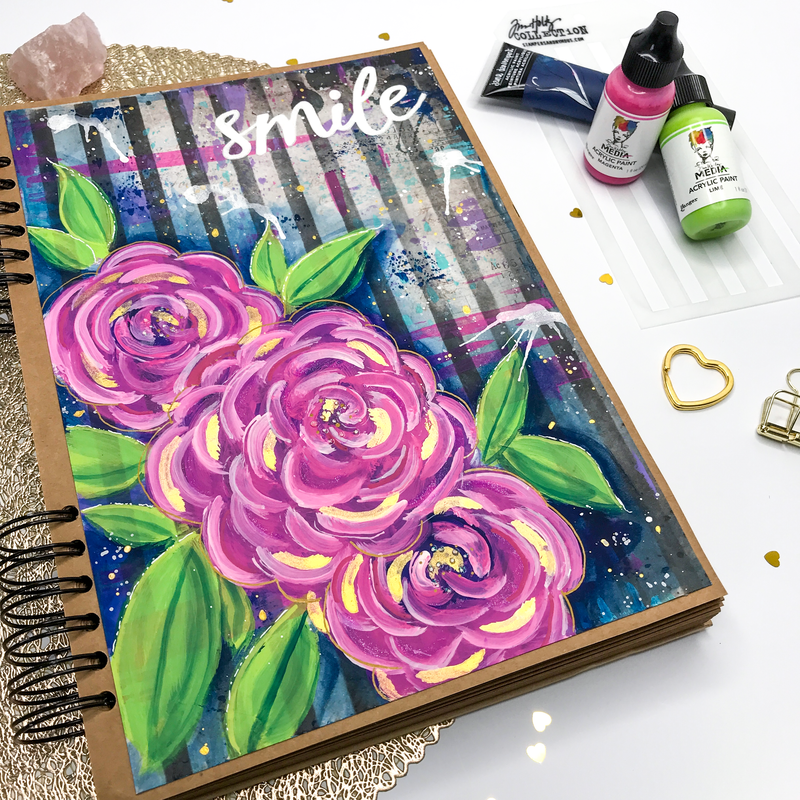 The book is designed with tear out pages and different types of paper so you can work right onto them and cut them out, add them to your journal pages, or in fact, journal right within the book… so many pretty images to choose from! I was also itching to use TCWs new mini botanical stencil designed by Marlene Meijer-van Niekerk. 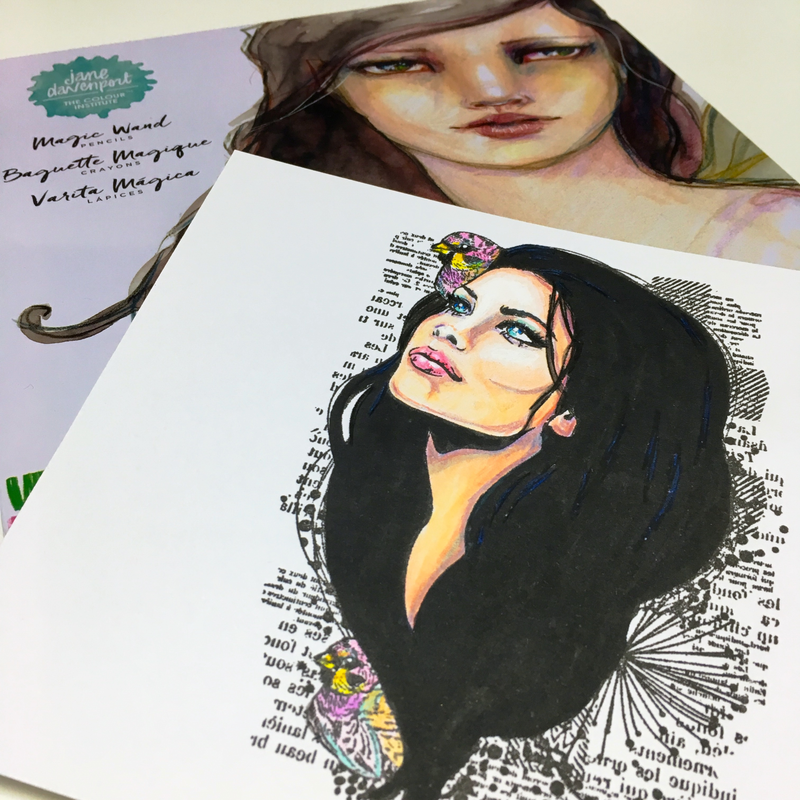 Lulu Art now has the full range of Marlene’s new products and I can’t wait to get my hands on those either. 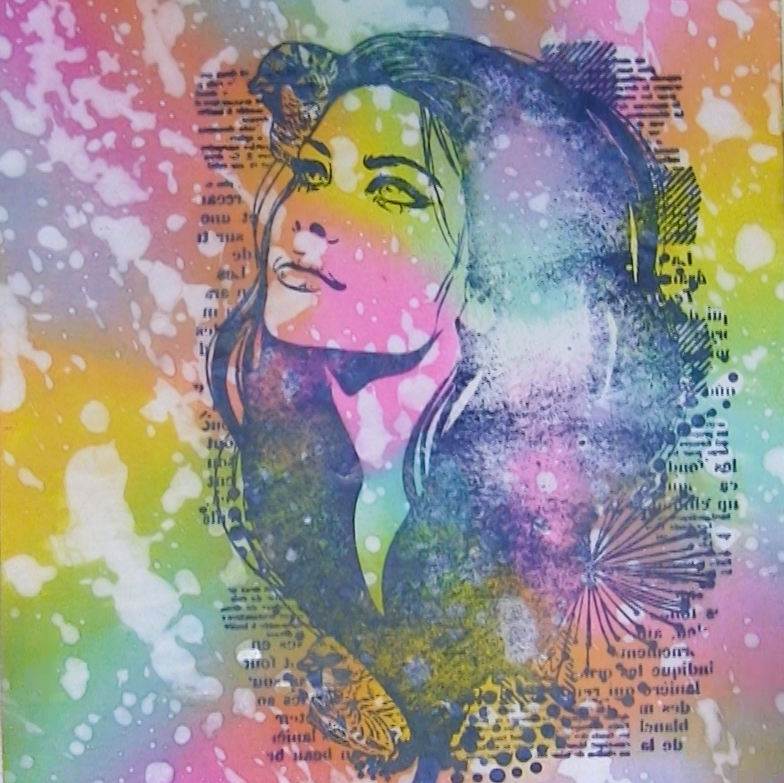 I have already made a number of pages with this stencil… just so pretty! Finally, I added Christine Adolf’s ‘Poppyfield’ stamp by Prima. Enjoy watching the complete video… it’s a quick one! 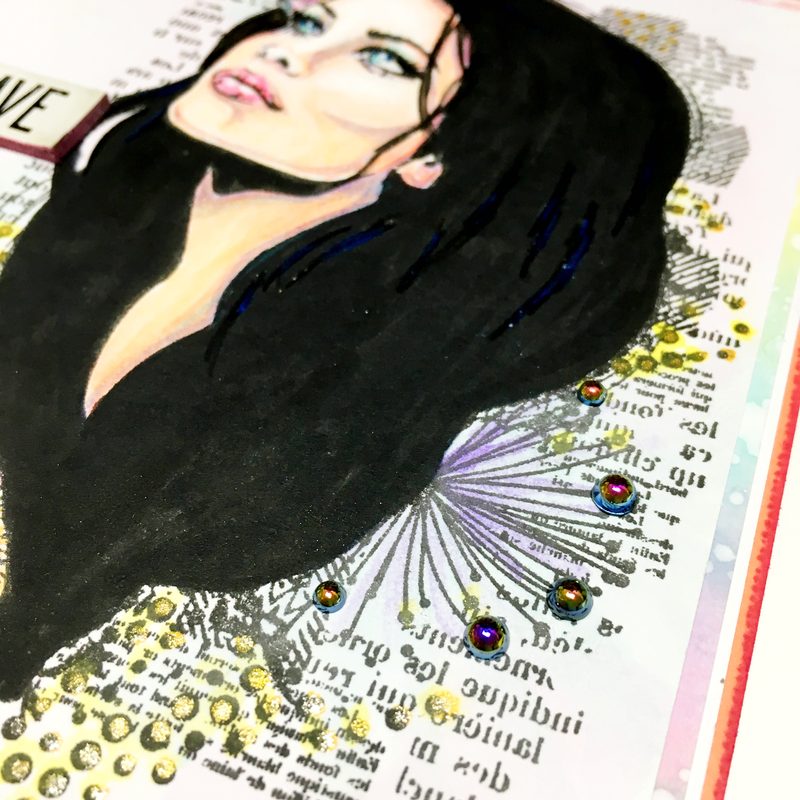 Have fun and hope you give this journal page a try. 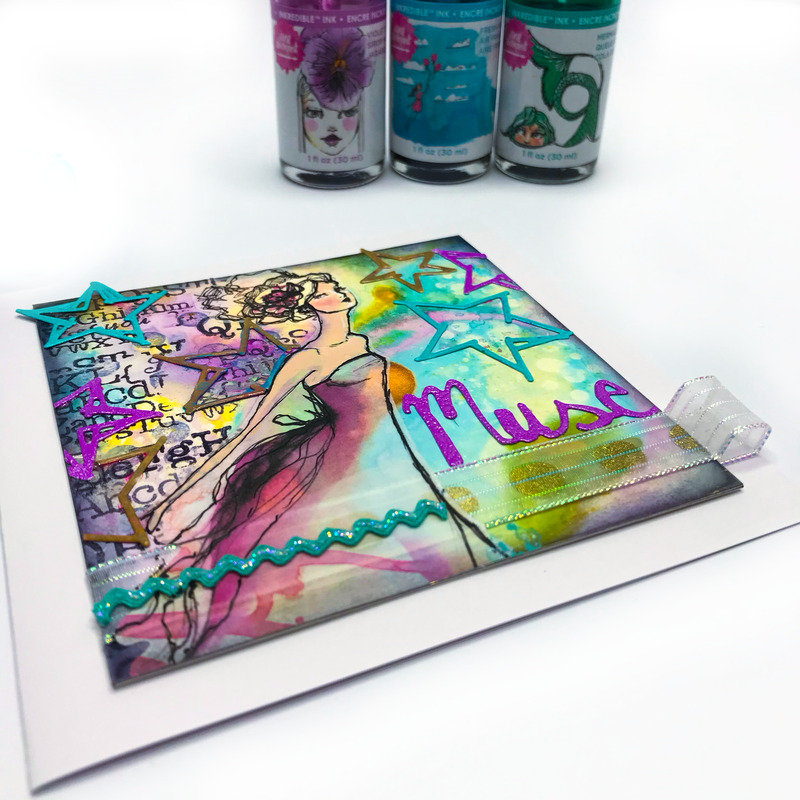 Hello beautiful Lulu Art fans, Kate here today with a bright and beautiful mixed media card to tempt you to get those stamps and inks out of the cupboard. 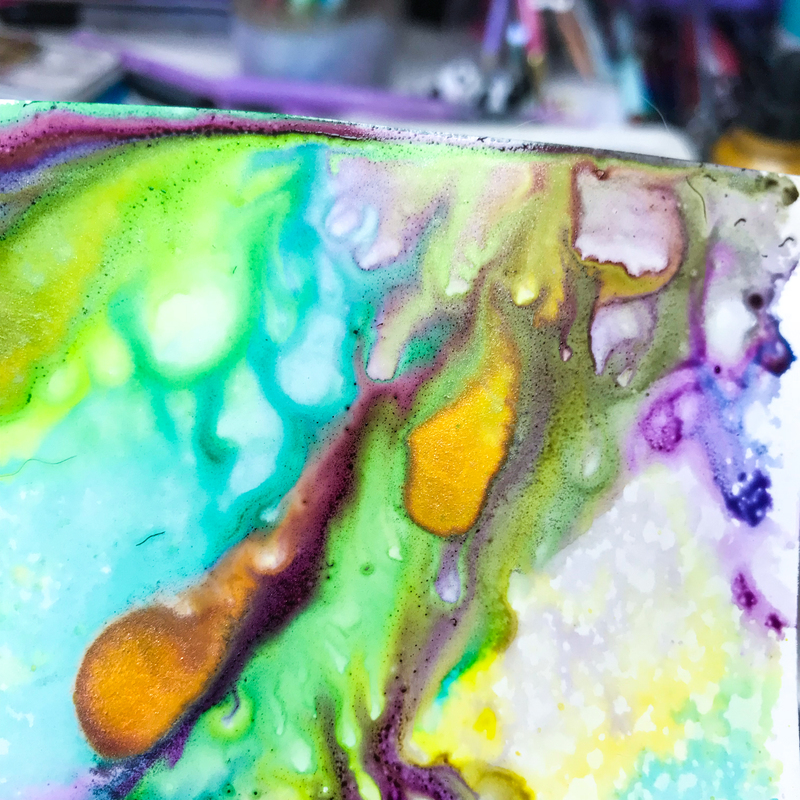 While there are a few steps, none of them are complicated, but just in case you need a little extra information I’ve filmed the whole process step-by-step. 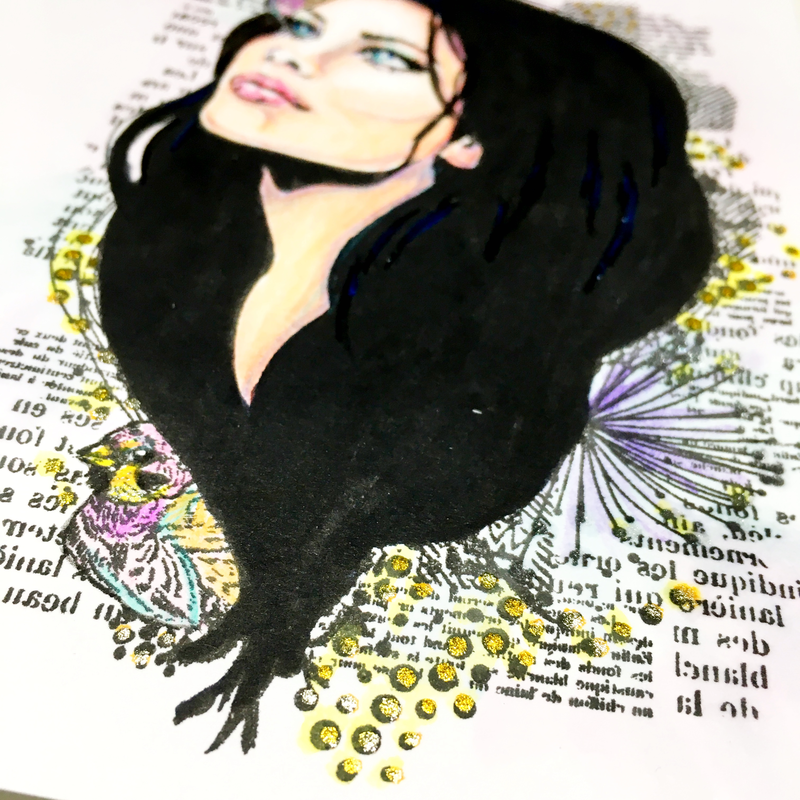 Start by stamping the gorgeous stamp Woman with Birds from Carabelle Studio onto smooth card, using black Versafine ink. Because there is such a large area of bold image (the hair) it’s likely that at least some port of this will not stamp perfectly! Use the Jane Davenport Mermaid Marker in Shark’s Eye to color in any imperfections, and I’ve gone over the whole area of hair just to make it nice and dark. 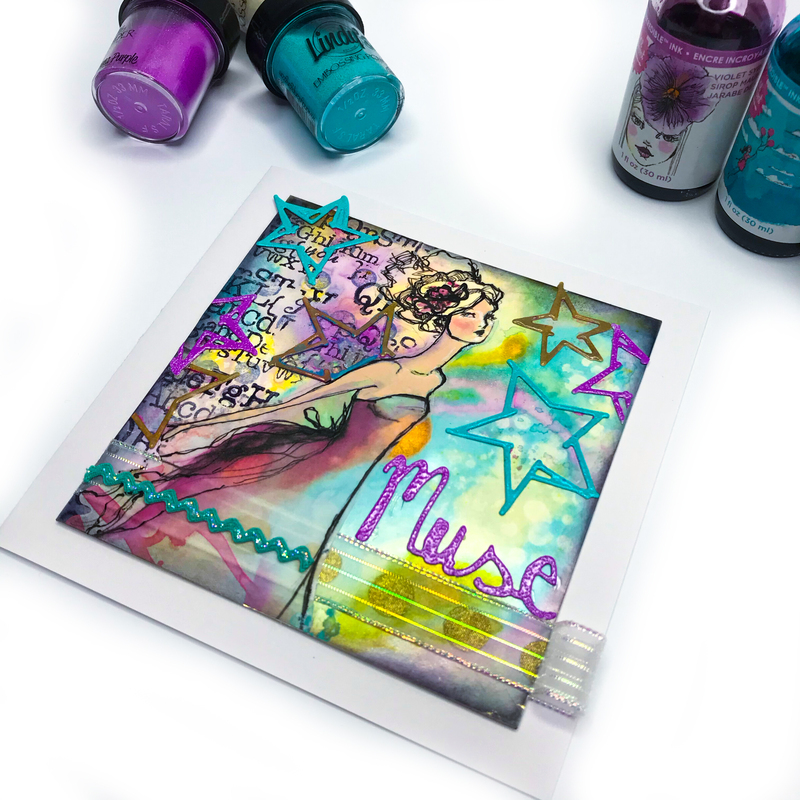 Start working on the base card, I wanted something bright and pretty to offset the dark stamp so I’ve used a piece of Ranger Specialty Stamping Paper (where I was testing out the stamp) and colored this using Distress Oxide Inks swirled on using a small Tim Holtz Mini Ink Blending Tool. 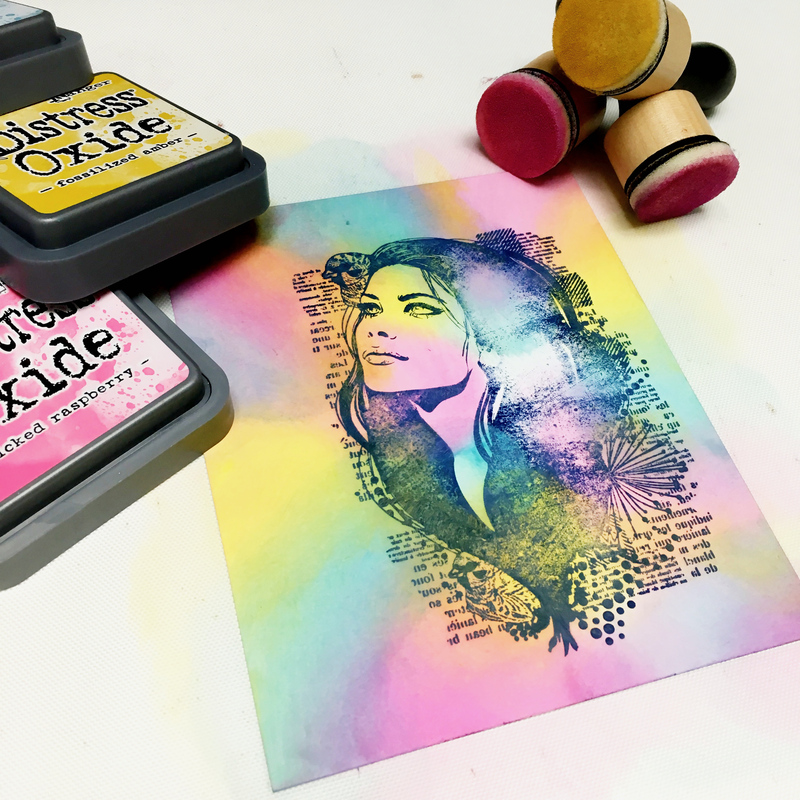 Once the background is colored the way you like flick some water over the ink and watch the magic happen – for a softer bleaching effect blot the water with paper towel after about a minute. 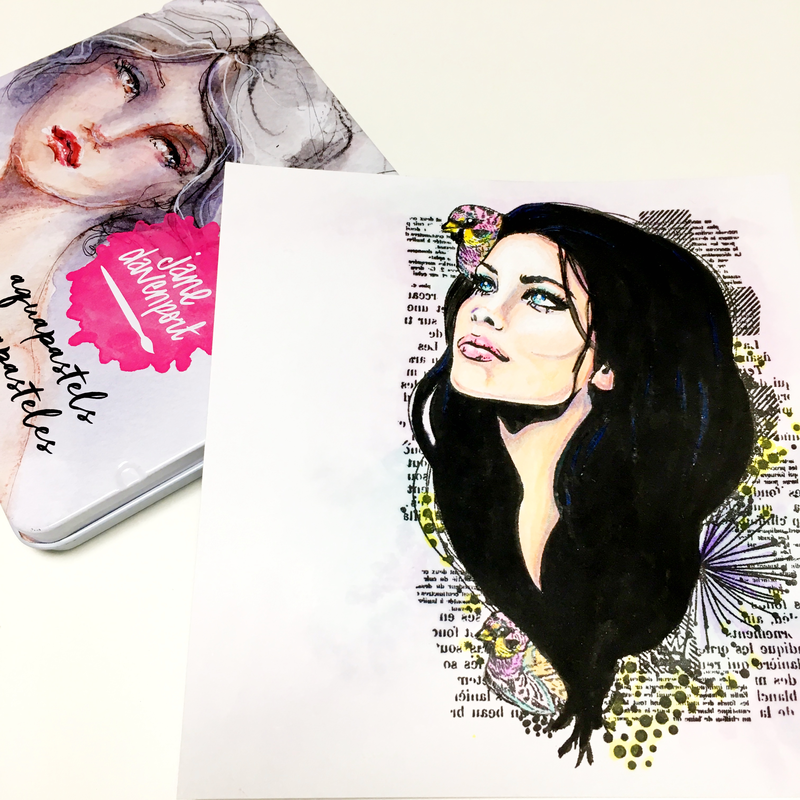 Use Jane Davenport Magic Wand pencils to color your image going heavy on the shadows to create a high contrast face. Water down AquaPastels and add a hint of colour to the area around the stamped image – just so the surroundings aren’t totally white, keep it light and bright. 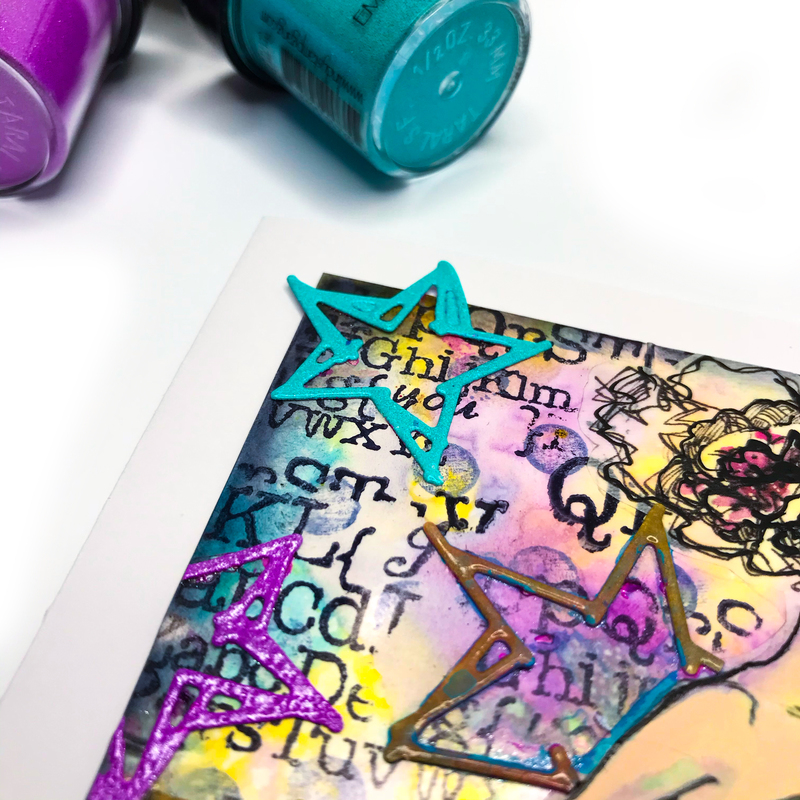 Embellish image with Glitz Sea markers to add a little sparkle. Color film strip ribbon with alcohol markers (I used Copics) so that it better matches your image and attach to card front using Glossy Accents – the ribbon is very twisty, so make sure to clamp with bulldog clips until the glue is dry or risk it springing off the card and rolling up! 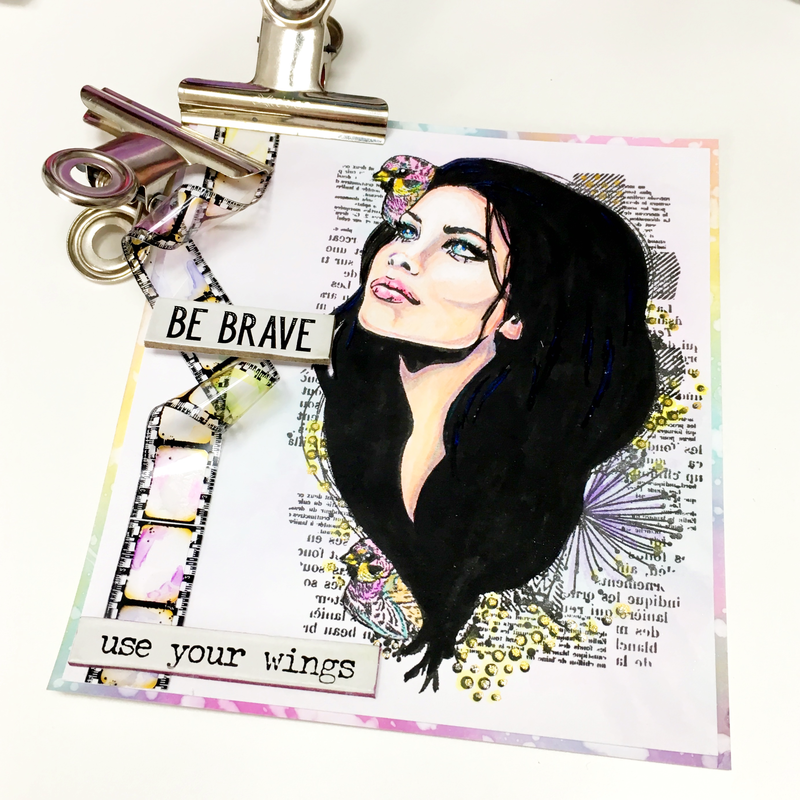 Add ‘Be Brave’ word embellishment and mount card front onto coloured base layer and then mount onto folded card stock. Attach a few small coordinating flat backed gems and the card is complete. 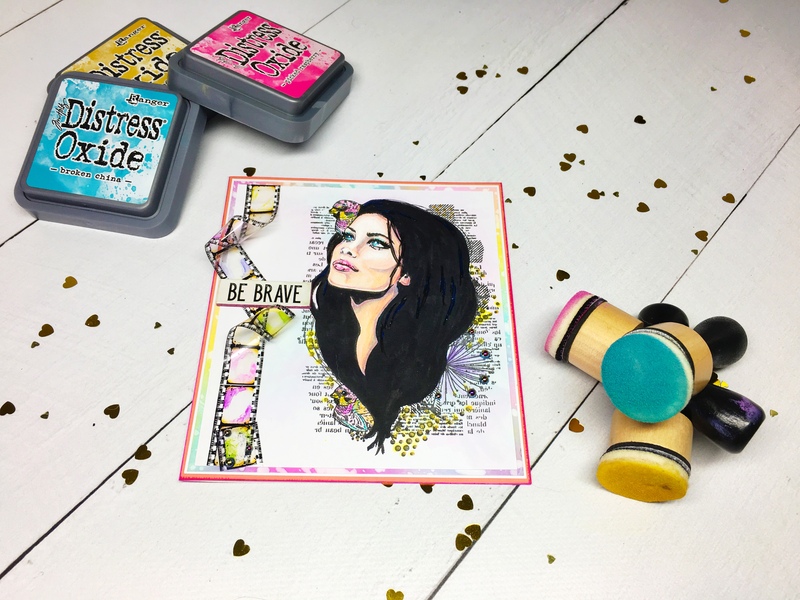 So glad to be back here with you this year and can’t wait to get into it and show off some of the fantastic products you can get from Lulu Art!! Thank you so much for having me back Kylie!! This month I have been working in one of the Dylusions dyalog journals. 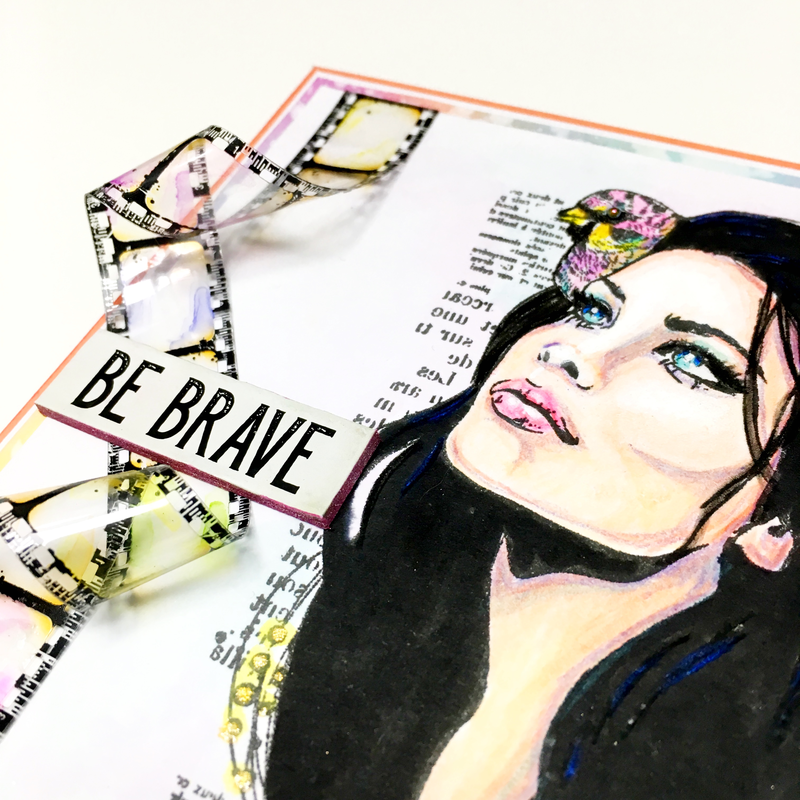 Because school is back in and I need to be taxiing the girls here & there, aswell as having started a new job, the amount of time I can spend sitting at my art desk is diminishing 😦 So I have been working on portable methods to journal and create. This little journal has been PERFECT!! 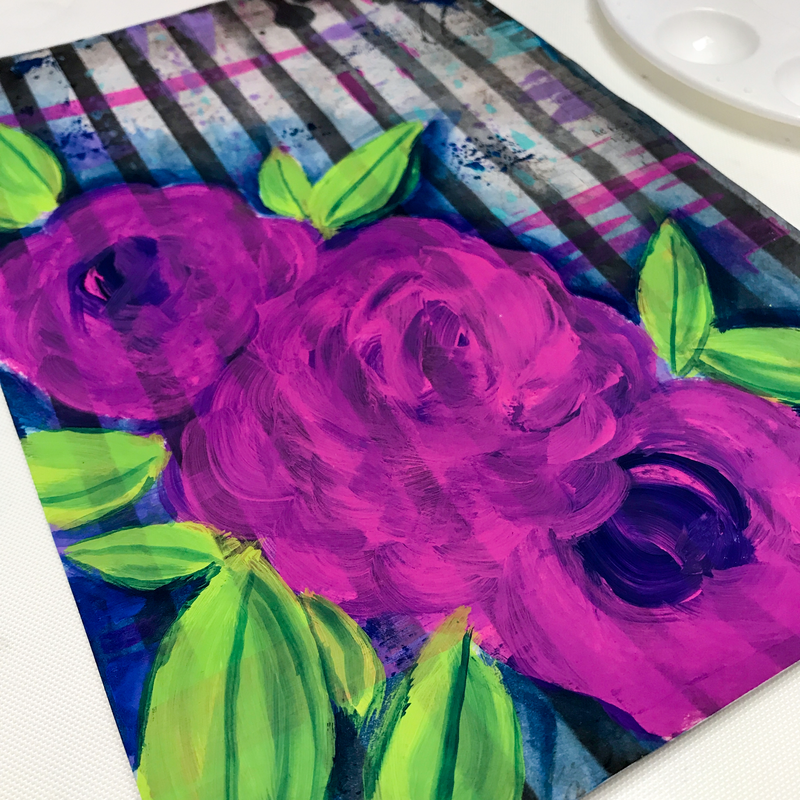 The backgrounds are already completed for you and with just a few supplies, I have been able to art at anytime, anywhere! 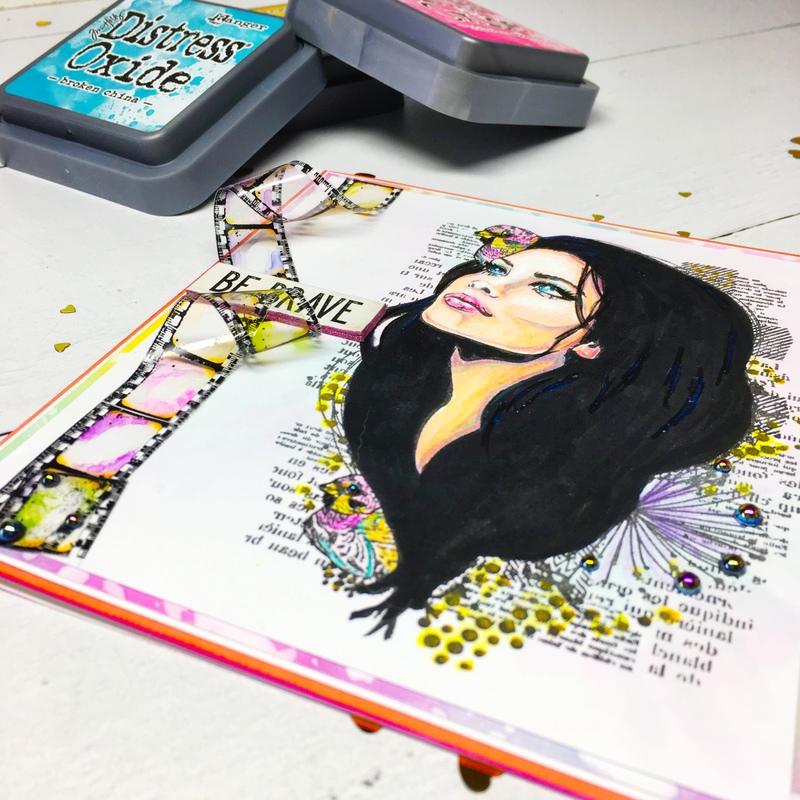 From here I use scribble sticks, black & white sharpies, prismacolor pencils & gesso to finish off the page and finally add some lettering with Tim Holtz ‘Big Chat’ stickers. Check out the process video below to get a closer look at how I went about creating this page. Hope this inspires you to journal on the go aswell! !